The bold bet on a cheaper iPhone turns up the heat on rivals. 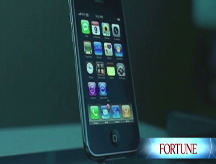 NEW YORK (Fortune) -- AT&T's iPhone price drop lowers the boom on its wireless rivals. Let's face it, the shiny new Apple (AAPL, Fortune 500) device with the dramatically lower price has got to be a tantalizing jewel to otherwise loyal Sprint (S, Fortune 500), Verizon (VZ, Fortune 500) and T-Mobile customers. The cool factor combined with a price break will likely send a fair share of big spenders over to Ma Bell. The decision by AT&T (T, Fortune 500) to subsidize an estimated $300 to $400 of each customer's iPhone purchase is a bold move to chase market share and, as AT&T pointed out yesterday, an expensive bet that may not pay off for two years. "It certainly ratchets up the competitive intensity of the industry," says UBS analyst John Hodulik. The move is the clearest sign yet that the slowdown in wireless growth has forced telcos to try and poach the other players' high-paying subscribers. The sharper tactics underscore the pressures phone companies feel from a cut-throat triple-play battle with cable companies. Huge network upgrade costs and new video technologies have created a churning customer cauldron with no clear winners. And this heightened competition comes during a cooling economy and a consumer spending slowdown. "We believe AT&T is looking to buy marketshare with the new 3G iPhone with significantly larger subsidies," Citigroup analyst Mike Rollins wrote in a research note Tuesday. AT&T said it will raise the price of the iPhone data plan by $10 a month, but even with that hike the company expects the big subsidy to take 11 cents off each year's bottom line for two years. "It's probably a smart move by AT&T. The question is: What will it do to the rest of the industry?" asks UBS' Hodulik. Not everyone thinks this is a sign of good health for the sector. One long-time telco analyst points out that in two years, which is when AT&T expects its big-subsidy bet to start paying off, is exactly when the iPhone contracts expire and users are free to go to the next cool thing. With subscriber growth slowing, telcos are trying to squeeze more out of each customer. One measure of this is average revenue per user. AT&T got about $95 a month from each user of the original iPhone, nearly twice the average wireless bill, adding up over two years to a take of about $1,700 after kickbacks to Apple. With its $300-plus subsidy, AT&T sets a high bar for wireless companies trying to win over high-end customers. "We will probably see an increase in subsidies on expensive phones," says Hodulik. Subsidies are not new - in fact they are a standard practice among telcos who split the costs of the phone with customers. But what AT&T plans to do to help lower the customers' iPhone cost to $199 is bring a once-expensive phone down to a relatively affordable level. In other words, rack up high costs to win more high-spending customers. The big test will come as early as August when Verizon starts selling Research in Motion's (RIMM) touchscreen BlackBerry, codenamed Thunder. The phone will be an exclusive for Verizon and a prime candidate to answer AT&T's iPhone. Given the hotter competitive climate Verizon may be feeling the heat to offer a costly subsidy of its own.